WASHINGTON, D.C. -- Americans who identify as lesbian, gay, bisexual, or transgender (LGBT) report lower well-being than non-LGBT Americans. LGBT Americans have an average Well-Being Index score of 58, lower than non-LGBT adults' score of 62. Importantly, these differences hold true even after taking into account the effects of gender, age, race and ethnicity, educational attainment, state of residence, and population density. The disadvantage in overall well-being is more acute for LGBT women than for LGBT men. LGBT women have a Well-Being Index score of 57, well below the score of 63 for non-LGBT women. 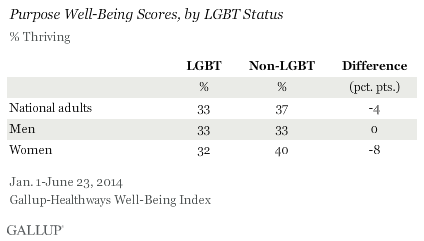 LGBT men also lag behind their non-LGBT counterparts in overall well-being, but not by as much -- 59 vs. 61, respectively. These findings are based on 2,964 interviews with LGBT adults and 81,134 interviews with non-LGBT adults conducted Jan. 1-June 23, 2014, as part of the Gallup-Healthways Well-Being Index survey. 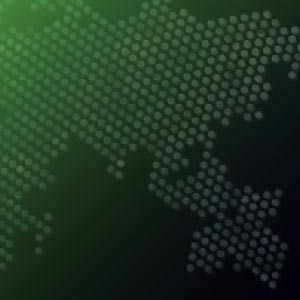 The Well-Being Index is constructed on a scale of 0 to 100, with higher scores indicating better overall well-being. The index includes questions that fall into five broad areas: purpose, social, financial, community, and physical. Each of these well-being elements consists of multiple questions on related topics that Gallup uses to categorize respondents into three groups: thriving, struggling, and suffering. Across all five elements of well-being, LGBT Americans -- particularly LGBT women -- trail their non-LGBT counterparts, even after taking into account possible differences in the demographic and geographic characteristics of LGBT and non-LGBT adults. The financial element is where the LGBT community falls furthest behind the non-LGBT population. LGBT Americans are 10 percentage points less likely to be thriving financially than their non-LGBT counterparts. For women, the difference is slightly above average, while for men it is slightly below. Financial well-being is made up of questions about standard of living, ability to afford basic necessities, and financial worry. These findings are consistent with research from UCLA's Williams Institute, which shows that the LGBT population is at a disproportionate risk for poverty and food insecurity. Physical well-being is another area in which there are stark differences between LGBT and non-LGBT Americans, particularly among women. One in three non-LGBT Americans are thriving physically, compared with about one in four LGBT Americans. This difference is entirely driven by LGBT women, as differences by LGBT status among men are not statistically significant. Physical well-being includes questions related to alcohol, drug, and tobacco use; current disease burden and past diagnoses; exercise; and eating habits. A variety of factors could contribute to LGBT women's disproportionately lower physical well-being. A recent analysis of the 2013 National Health Interview Survey reported higher levels of smoking and alcohol consumption among LGB women than among non-LGB women, as well as elevated weight and psychological distress among bisexual women. LGBT Americans are less likely than their non-LGBT counterparts to be thriving in their social lives. Thirty-five percent of LGBT adults are thriving socially, compared with 41% of non-LGBT adults. The gaps for men and women are the same. Social well-being includes questions about relationships with friends and family, personal time, and received encouragement and support. LGBT Americans are less likely than their non-LGBT counterparts to be thriving in community well-being -- 32% vs. 38%, respectively. This difference by LGBT status is largely driven by women. LGBT status is not a significant factor in men's assessments of their communities. Community well-being includes questions about community pride, involvement, and safety and security. Overall, LGBT Americans trail non-LGBT Americans in reporting a strong sense of purpose in life (33% vs. 37%, respectively). This gap reflects the substantial difference that exists between LGBT women and non-LGBT women. The comparable figures for men do not vary by LGBT status. Purpose well-being is composed of questions about having an inspiring leader, daily activity, goals, and strengths. Despite evidence of decreasing social stigma directed toward the LGBT community in the U.S., LGBT Americans -- particularly LGBT women -- show a wide range of well-being disparities compared with their non-LGBT counterparts. 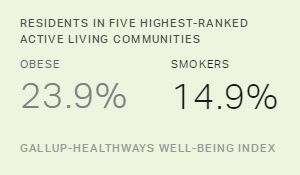 In measures of physical health, financial security, sense of purpose, social life, and community attachment, data from the Gallup-Healthways Well-Being Index reveal that LGBT adults experience a wide range of well-being challenges. These disparities associated with sexual orientation and gender identity highlight the ongoing need for the inclusion of sexual orientation and gender identity measures in data collection focused on health and socio-economic outcomes. Availability of better data that identify the LGBT population will help researchers, healthcare policymakers, and healthcare providers craft better strategies to understand and prevent well-being disparities associated with sexual orientation and gender identity. Results are based on telephone interviews conducted as part of the Gallup-Healthways Well-Being Index survey Jan. 1-June 23, 2014, with a random sample of 2,964 LGBT adults and 81,134 non-LGBT adults, aged 18 and older, living in all 50 U.S. states and the District of Columbia. For results based on the total sample of LGBT adults, the margin of sampling error is ±2 percentage points at the 95% confidence level. For results based on the total sample of non-LGBT adults, the margin of sampling error is ±0.4 percentage points at the 95% confidence level. Americans who have received recognition for helping to improve their communities in the last year have higher overall well-being and are less likely to report experiencing stress and worry than those who haven't received such recognition.